If the relevance of protest art was ever in question, it isn’t now, said The New Yorker. 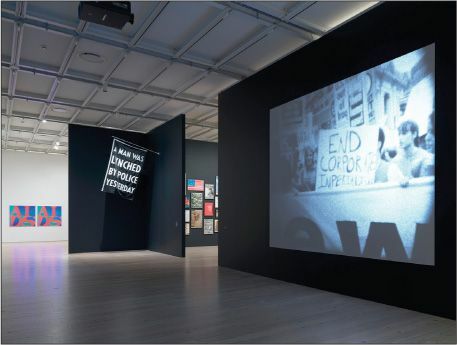 Artists often create work intended to challenge established thinking, and the Whitney’s edifying new survey of political art from the past eight decades demonstrates there are countless ways to shake up a viewer. When artist Felix Partz died of AIDS in 1994, his friend and artistic collaborator AA Bronson created a billboardsize photographic portrait of Partz’s skeleton-like body wrapped in multicolored quilts several hours after his death. When Senga Nengudi wanted to protest violence against women in 1977, she created an abstract figure by stretching a web of brown pantyhose in a way that evokes flayed skin. In the context of the show, “abstraction looks surprisingly powerful.” Melvin Edwards’ Pyramid Up and Down Pyramid strings barbed wire across a room to divide it into new volumes. Such works could be the new monuments our public spaces need. Much of the art, though, falls into one of two traps, said Jonathon Keats in Forbes.com. Protest posters are “particularly problematic,” because “their impact as agitprop requires immediacy that is antithetical to artistic insight.” Often they look great, but tell us nothing that only art can. “At the other extreme” sit politically engaged artists “who attempt to channel their convictions through the abstruse language of contemporary art.” Theaster Gates’ Minority Majority (2012) is a wall-mounted sculpture constructed of plywood, vinyl, and fire hoses. It’s visually engaging, for sure, but you wouldn’t know without the wall text that you’re meant to think of the fire hoses used against 1960s civil rights protesters. Occasionally, though, the right balance is struck. In 2005, Josephine Meckseper used a Super 8 camera to film a Washington, D.C., protest against the second Iraq War. The graininess of the silent footage causes the march to resemble a Vietnam-era antiwar protest, thus throwing into question whether protests ever succeed.